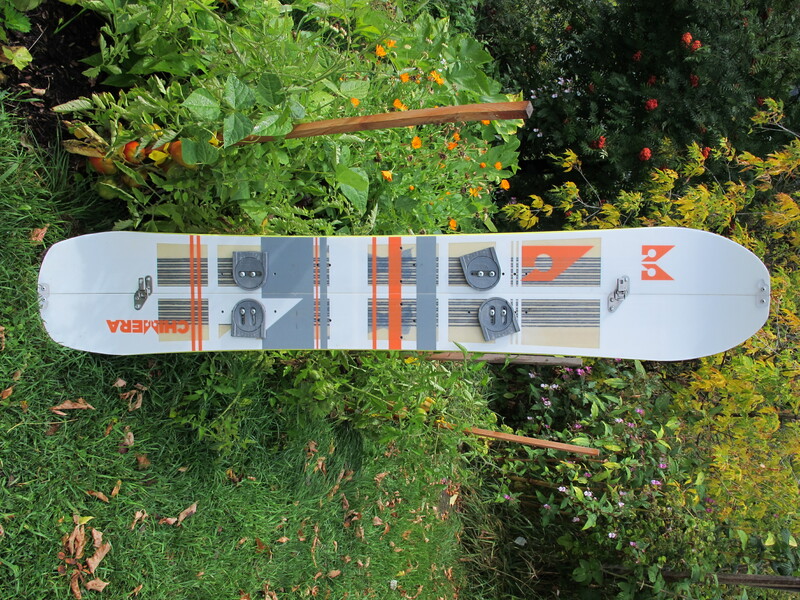 You are currently browsing the tag archive for the ‘Chimera Splitboards’ tag. 1. A fabulous creature with parts from different animals, originally with a lion’s head, a goat’s body, and a serpent’s tail and supposedly a personification of snow or winter. 2. A vain, foolish, or incongruous fancy, or creature of the imagination. 3. An organism with genetically distinct cells originating from two zygotes. These are the Wiktionary’s definitions of Chimera, and it is easy to relate any one of the three to split-boarding. 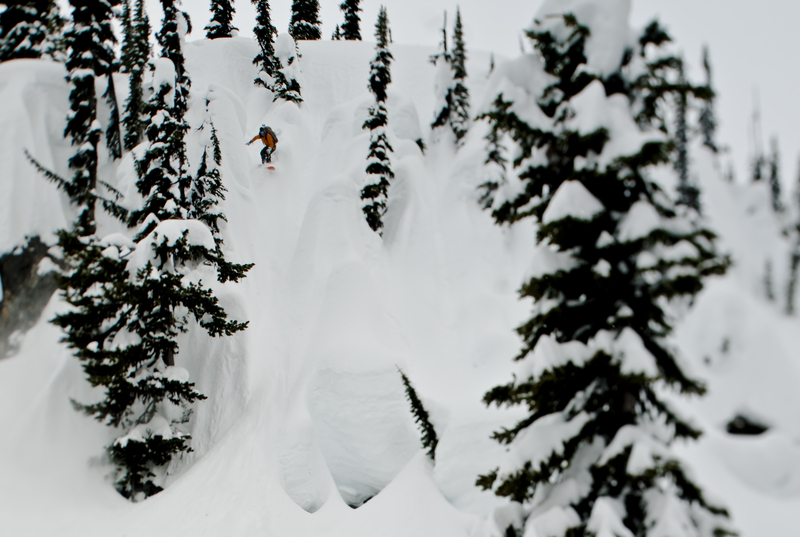 The inaugeral Split-Fest held at Roger’s Pass this past winter brought out 60 + folk who have found the magic of ascending mountains on skis and tearing their way down on a snowboard. One of them happened to be Alister H., a compatriot from the early days in Rossland, whom I hadn’t seen in a over decade. 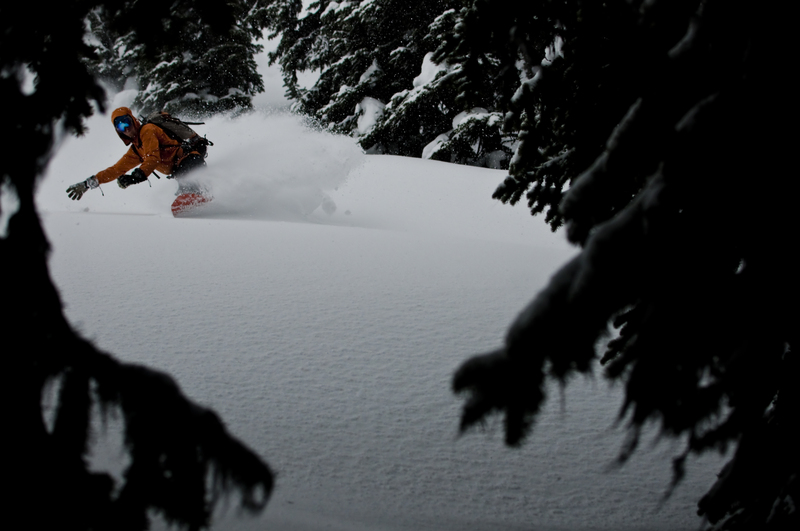 We got right back to shreddin’ (in epic, deep powder), and it turns out that Alister is in the midst of firing up a Wasatch based company that produces handmade splitboards. Exclusively. Aptly named Chimera. As the weekend drew to a close, Alister had answered a good many questions about the prototype board he was rockin’, and he had an inkling of what the ideal board would be for the Revy crew…. A month later he showed up with the stick, and it was love at first sight: 165 cm Mace, big mountain charger! I got it set up pronto, and we headed out for Cheops North for a little test drive. Dropping in, I immediately felt the board’s stiffness (carbon fibre in the area under foot when in ski mode, and some in the tail as well) . Now I like a stiffer board, so I laid in a hard heel-side in the firmish conditions to see about control. Awesome. This is a board I can go as fast as I want on. I took the deck with me on a four day photo-shoot at Sol Mountain Lodge, and I continued to be impressed by the boards features. Like the reduced tip swing weight provide by minimizing the metal edge at the “split“. And the non-stick light colored topsheet. And the Mace continued to perform, nicely captured by Bruno Long in these pics. Thanks to Jeff Mitchell, Bruno Long, the Cooperman Family at Sol Mountain, and Alister Horn at Chimera.